Last week I showed you how I made a vintage shabby chic swing card using just one Distress Ink pad to create a watercolour effect. I'm back today to share two mini cards and this time I've combined more than one ink pad to create a multiple colour watercolour effect. I used Blockheads dragon and chop stamps from their Chinese Princess set with Fired Brick and Peacock Feathers Distress Ink pads to create the Chinese Dragon card. 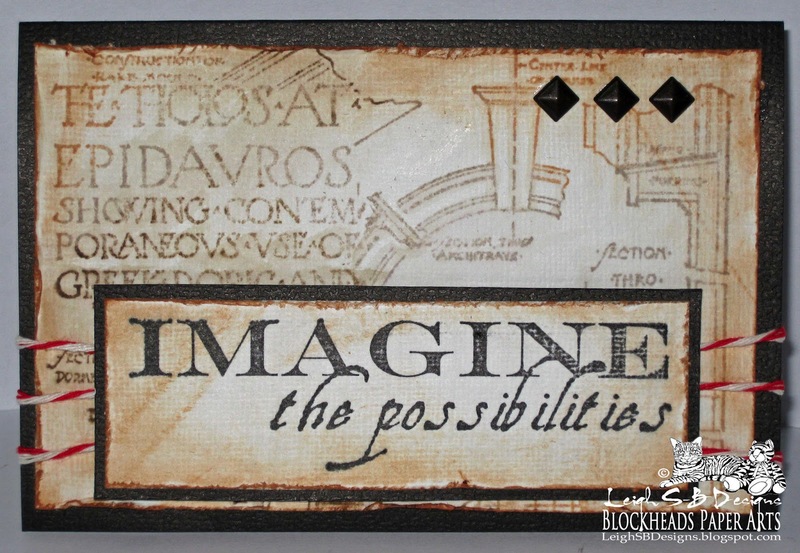 I used Blockheads Architectural collage and Imagine the Possibilities sentiment stamps from their Architecture set with Pumice Stone, Tea Dye and Walnut Stain Distress Ink pads to create the more masculine mini card that would be perfect as a Grad card! 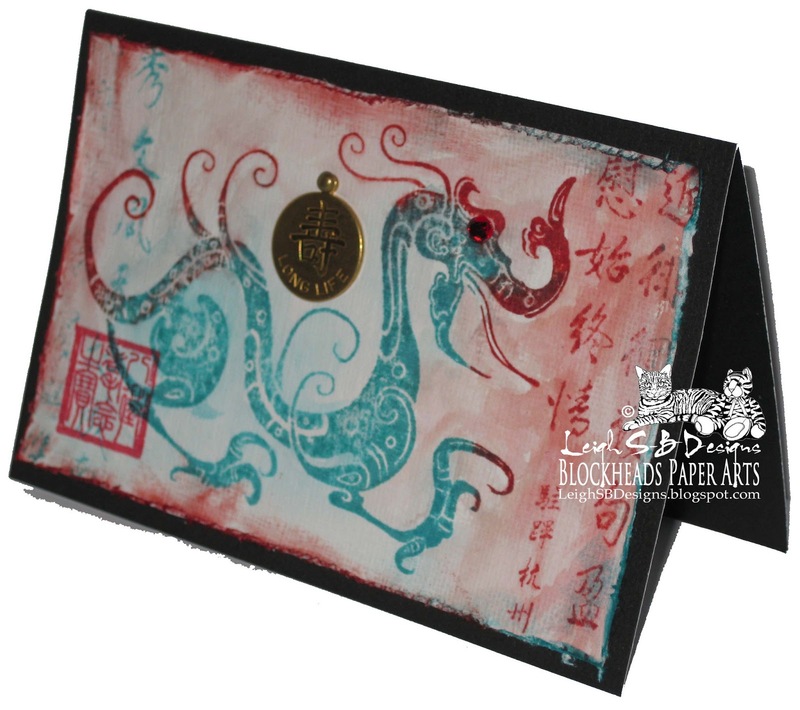 Make two folded mini cards that measure 4.5"x 3" out of black cardstock and cut two panels slightly smaller from a sheet of watercolour paper. To create the multi-colour effect apply the different inks to the stamp images at the same time and stamp them onto the watercolour panels. I used a Niji Watercolour brush filled with water to gently work at the images until I liked the result. The sentiment was stamped with Black Soot Distress Ink onto a scrap piece of watercolour paper but this time I left it as is. The Chinese Chop was stamped onto the Chinese Dragon card with Lady Bug Memento ink. All 3 panels were then tattered with Tim's Paper Distresser tool and Tea Dye Distress Ink applied to all the edges with a foam ink applicator tool. 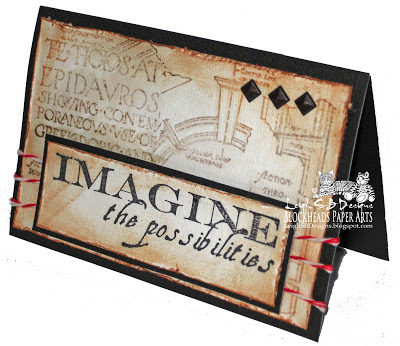 Adhere the panels to the cards with your favourite craft glue or double sided tape. My favourite glue of choice is Scotch Quick Dry Adhesive. 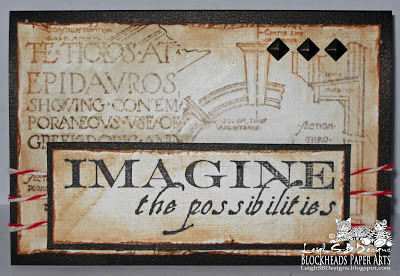 The sentiment was adhered to a scrap of black card and I used my Perfect Layers tool #2 to cut the 1/16" border. Before adhering the sentiment panel I added the red and white butcher's twine and then adhered the sentiment in place with dimensional silicone glue. 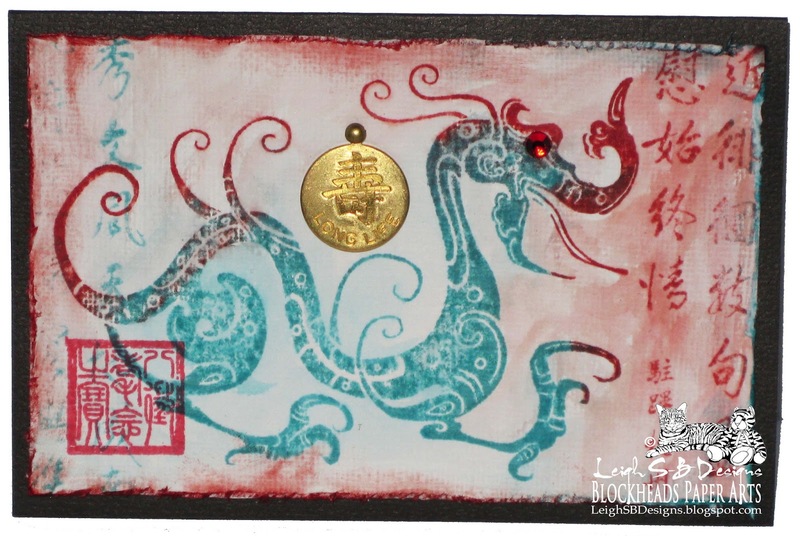 I also attached the Chinese Charm to the stamped panel with a tiny antique gold brad before adhering it to the card. I completed each card with a few small embellishments adhered in place with Quick Dry Adhesive. 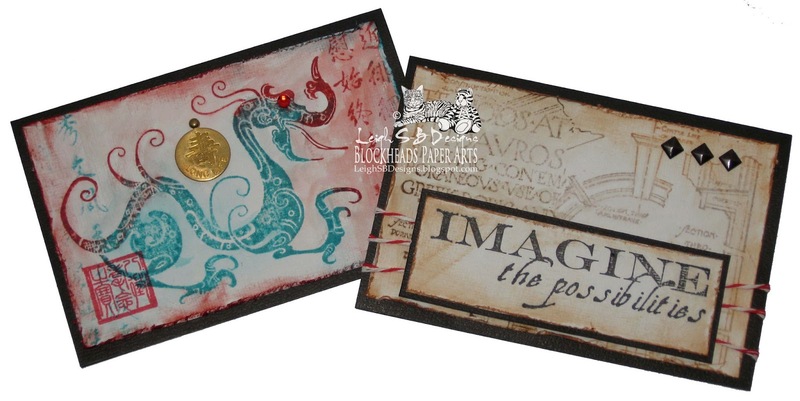 I added a red rhinestone to the eye of the Chinese Dragon and 3 antique gold pyramid adornments to the Imagine card. Love these mini cards and the distress watercolour technique! !